Let’s take a little trip down Hypothetical Lane in today’s post. Suppose with us you are relatively young — perhaps still in your twenties. You’ve graduated college, been in the workforce for a few years, but find there to be something decidedly lacking in the entire affair. It’s not that you were sold a bill of goods at some point that led you to believe that joining the business world would be endlessly meaningful and rewarding, it’s more that you realized you are at the point in your life where you might not be able to independently travel and have the “adventure” you’ve made part of your identity since you decided to live in another country for at least a year way back in high school. Now that you’ve grown up a bit, you’ve also become perhaps a bit more jaded, or, as an optimist might put it, “experienced;” you get that wanting to live in a different country doesn’t make you unique. Neither does actually following through on that act, for that matter, but doing something significant simply because it’s unique is no good reason for doing that thing in the first place. You should move to another country because you want to, plain and simple. So move you do. You forego the familiar comforts of home in favor of a foreign land. And because you were lucky enough to get your degree, you are eligible to be employed by the Spanish government as an ambassador of culture and the English language. While your degree was definitely not in English, cultural studies, or education, you figure that you’ll figure it out on the go and see what happens. You wanted to have an adventure, after all. But before you can, you’ve got some red tape to cross. After you make the decision to move to Spain and become a defacto teacher’s aid, you piece together an essay and application written in Spanish, deriving around 10 percent of the content from your own grasp of the language, and the remaining 90 from the internet and your quasi-fluent sister. The application process is disorganized and arduous — but you squeak in. Little do you realize that the application process, as stress-inducing as it proved to be, would be a relative walk in the park when compared with an immigration application process that is yet to come. But we are getting ahead of ourselves. You arrive in Spain, and after the first few hours realize that you have grossly overestimated your ability to speak the Spanish language. You also may have overestimated your willingness to look like a fool in public, because you don’t seem to be able to “try, fail, repeat,” as you’ve been advised to do more than a few times. Undaunted, you figure out how to survive and, eventually, thrive in your new setting. Let’s get to the point here, shall we? You got more than you bargained for on this trip. Not only did you leave the corporate world (for a time), learn a new language, make friends, see amazing relics, visit historical sites, and have that adventure you were seeking, but you met the love of your life as well. To make a long story short (too late! ), you and your newfound darling plan your new life together over the following few years. Among a host of other life-altering decisions to be made, you settle on settling down in the United States. She loves your family, you have a job in the States, so you decide to go with it. You get engaged, and seek out the next steps to turn this dream into a legal reality. Now that you’ve made the call to call the US the permanent home of you and your betrothed, you’ve got to figure out how you can make that happen. And because your fiancée is an alien, it falls on you to figure out the details of how you can get her over here, how to make her a legal resident, and, eventually, a lawful citizen of the United States. So concludes part one of this two-part series involving immigration law, the K-1 Visa, and a very hypothetical story told in order to make this topic more relatable in a sense. If you are interested in reading how the story ends, in addition to reading a few tips from your local Vienna law firm, keep an eye out for part two. 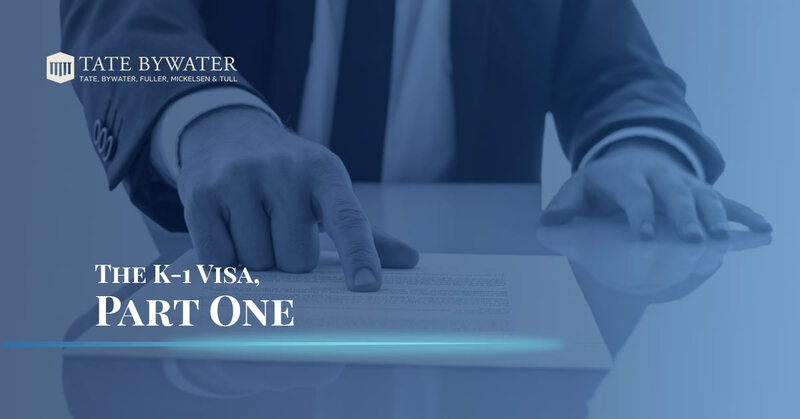 Remember, if you are in immediate need of an immigration attorney, don’t hesitate to give us a call at Tate Bywater Law. We will schedule your free consultation today. We have offices in Vienna, VA and in Saint Leonard, MD. Contact the right attorney at law today, and if you would like more general information regarding our immigration law services, you can check out our resource dedicated to our immigration practice area. Remember to stay tuned!